Knob Hill is a subdivision in Bloomfield Township, Michigan comprised of 89 single-family homes. Originally an apple orchard owned by the Forman Brothers, Knob Hill was developed in 1961. The Forman Farmhouse, located on the corner of Quarton and Franklin Road is currently occupied by descendants of the original family. Knob Hill borders Franklin Rd, Lone Pine Rd, and Quarton Rd. Homes were built between 1961-1963 in sizes from 1600 to 3400 square feet. The homes have a variety of styles including colonial, ranch-style, Tudor, and multi-level homes. You’ll find layouts with 3-5 bedrooms and 2-3.5 bathrooms and lots up to a half acre. Mature landscaping, quiet streets, and large trees are prominent here. Knob Hill is part of the Bloomfield Hills Public School District and is served by Cornant Elementary School just a mile away, Bloomfield Hills Middle School, and Bloomfield Hills High School. The Wing Lake Developmental Center serving K-12 is also an option for Knob Hill homeowners. Close by is the Bloomfield Square Park surrounding a small lake with trails and playground equipment. The closest amenities are south at the corner of Inkster Rd. and Walnut Lake Rd. Here you’ll find the Market Square, Ace Hardware, salons and veterinarian facilities. Bloomfield Hills is just 5 minutes northeast or 2.5 miles. Telegraph Road is also just a couple minutes east of Knob Hill. 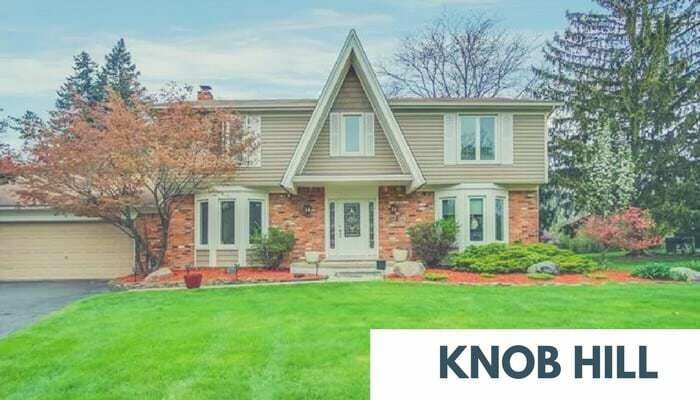 For more information on Knob Hill, browse the listings below or contact me anytime to schedule a showing or for more details on this and similar neighborhoods in Bloomfield Township.